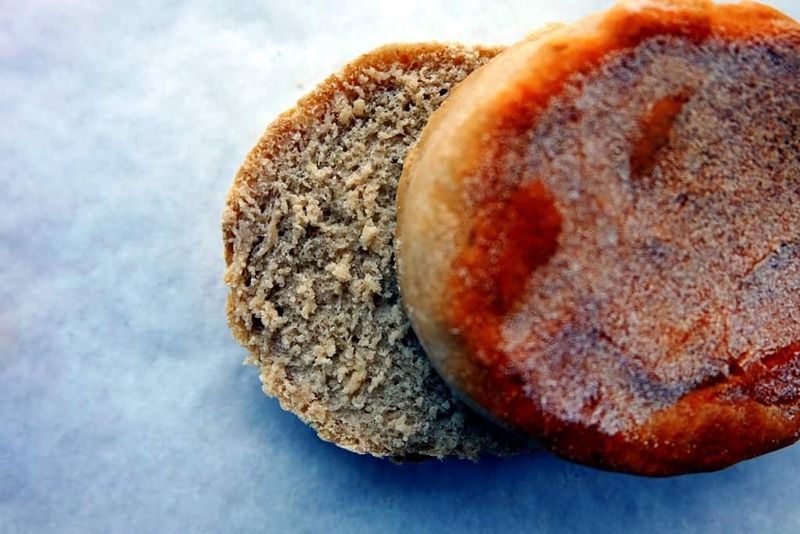 I love buckwheat flour pancakes for my weekend breakfast, so I decided to add some buckwheat flour into my English breakfast muffin recipe. It works a treat! The buckwheat flavours come through very subtly and the dominance of strong white wheat flour ensures the muffins get a good rise and come out with a soft, even and well structured crumb. 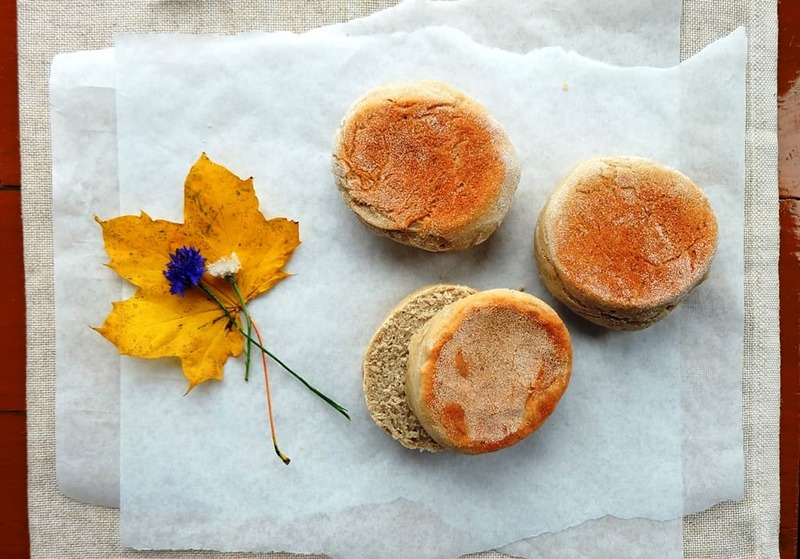 So if you’re looking for English muffin recipe ideas with a twist, these buckwheat English muffins are an easy and tasty way to start. Prepare the dough on the evening before you’d like to serve the muffins for breakfast. You can keep the dough in the fridge overnight. 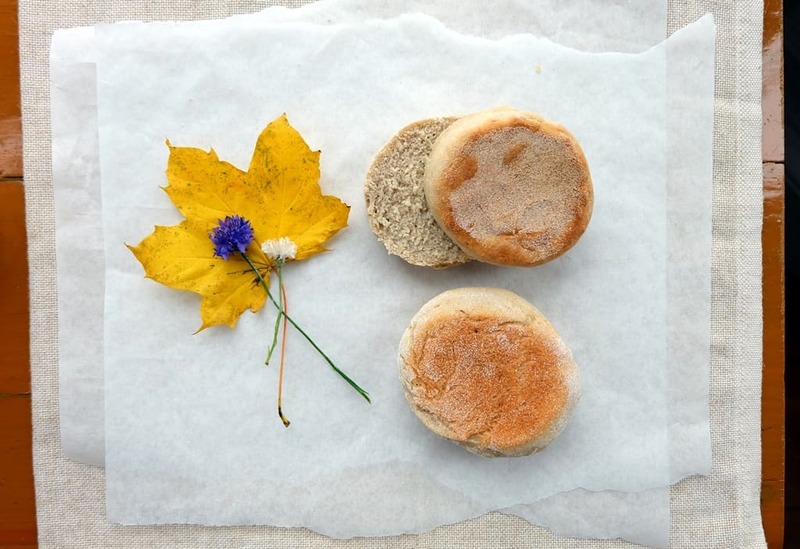 Take the muffin dough out of the fridge an hour before you need it and – one hour later – you can sit down to enjoy your beautifully flavoursome buckwheat flour English muffins. Combine all ingredients and form a dough. Place in a bowl, cover with a lid and leave to rise for 30 minutes. Punch down the dough in the bowl, cover with the lid again and place in the fridge overnight. Take the dough out of the fridge and leave to warm up to room temperature for about an hour. Turn the dough out onto your work surface and roll out to about 2 cm thick. Cut out six muffins with a straight-sided cutter, 9cm in diameter. Lightly dust part of your work surface with fine semolina. Place the muffins on the semolina layer, ensure you keep some space between them as they will expand slightly. Turn the muffins once to ensure both the top and bottom are covered in semolina. Cover with a tea towel and leave to prove for 30 minutes. Preheat a heavy-based frying pan on the hob at a very low heat. Place the muffins on the hot frying pan plate and cover the pan with a lid, to capture the heat. Toast the muffins for approximately 5-10 minutes (keep an eye out to prevent burning), then flip over and griddle for another 5-10 minutes on the other side. I use a thermometer to ensure the inside temperature of the dough has reached 94°C which means the muffins are fully baked through.